Saveur is a gourmet, food, wine, and travel magazine that specializes in essays about various world cuisines. Its slogan—Savor a World of Authentic Cuisine—signals the publication’s focus on enduring culinary traditions, as opposed to ephemeral food trends. 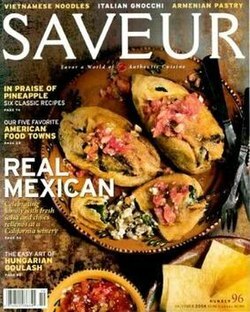 Celebrated for its distinctive, naturalistic style of food photography and vivid writing, Saveur has been notable for placing food in its cultural context, and the magazine’s popularity has coincided with a growing interest among American readers in the stories behind the way the world eats. The publication was co-founded by Dorothy Kalins, Michael Grossman, Christopher Hirsheimer, and Colman Andrews, who was also the editor-in-chief from 1996 to 2001. It was started by Meigher Communications in 1994. World Publications bought Saveur and Garden Design in 2000. World Publications was renamed Bonnier Corporation in 2007. A popular feature is the “Saveur 100”, an annual list of “favorite restaurants, food, drink, people, places and things”. Saveur was created by Dorothy Kalins, then editor-in-chief of Metropolitan Home magazine. Kalins launched the new food magazine with the help of Christopher Hirsheimer (who produced food stories for Metropolitan Home) and Colman Andrews (who wrote a column for that magazine). Kalins served as Saveur's founding editor-in-chief, with Michael Grossman as creative director, Andrews as executive editor, and Hirsheimer as food editor. Saveur was originally published six times a year by Meigher Communications, a now-defunct publishing company founded by Chris Meigher, a former Time Inc. executive. Saveur has always been based in New York City. Kalins departed Saveur in 2000 after the magazine was purchased by World Publications, a special interest magazine company based in Winter Park, Florida. Under World Publications the magazine was published eight times a year. Andrews served as in editor-in-chief until 2006; he departed shortly after Bonnier, the Swedish media company, purchased a minority stake in World Publications. James Oseland, a regular Saveur writer who was brought on by Andrews as executive editor, became editor-in-chief in 2006. Oseland, whose first cookbook, Cradle of Flavor: Home Cooking from the Spice Islands of Indonesia, Singapore, and Malaysia, was published in 2006, built a new editorial team. While hewing to the magazine’s original mission, the new editors welcomed a growing readership with special feature packages and single-topic issues—from The World of Butter (March 2008) to The Glories of Greece (August 2010)—each of which tackled a single theme in depth. These themed packages and issues included not only recipes and techniques, but also multiple narratives, providing diverse perspectives on each topic of focus. Celebrated essayists, novelists, comedians, and other storytellers have turned to the subject of food in the pages of Saveur: In the magazine’s October 2010 25 Great Meals issue, Rita Mae Brown wrote of a meal she shared with her grandfather’s hunting dogs; Dean Koontz, about sharing sandwiches with his uncle; Marc Maron, about cooking Thanksgiving dinner for his calorie-conscious mother. In 2014, the editors of Saveur published Saveur: The New Classics Cookbook. Contributors included James Oseland and Helen Rosner. In 2010, Saveur opened nominations for the inaugural “Best Food Blog Awards” in nine categories. In 2011, readers voted for their favorite food blogs in 17 categories, including Best Food Photography, Best Regional Cuisine Blog, and Best Kitchen Tools and Hardware Coverage. 2014 was the first year featuring “Reader’s Choice” and “Editor’s Choice” winners. The 2015 awards honored 78 blogs in 13 categories. Saveur has a circulation of 325,000 subscribers, and Saveur.com has 2 million unique visitors monthly. Saveur has been awarded 23 James Beard Journalism Awards. It has been a finalist for the American Society awards 19 times, winning seven. ^ “eCirc for Consumer Magazines”. Alliance for Audited Media. December 31, 2012. Retrieved June 21, 2013. ^ a b Terrie L. Wilson (2003). “Tasty Selections: An Evaluation of Gourmet Food Magazines”. Journal of Agricultural & Food Information. 5 (2): 49–66. doi:10.1300/J108v05n02_06. ^ a b “Nonfiction Book Review: Saveur: The New Classics Cookbook—More Than 1,000 of the World’s Best Recipes for Today’s Kitchen”. Publishers Weekly. Retrieved 2018-03-26. ^ Daley, Bill; Hevrdejs, Judy; Gray, Joe (2014-12-03). “Our 10 favorite cookbooks of the season”. Chicago Tribune. Retrieved 2018-03-26. ^ Hoffman, Maggie. “Helen Rosner’s Favorite Cookbooks”. Serious Eats. Retrieved 2018-03-26.